Stressor number four. I now have to go back to my apartment and get the money and then return to pay for the work. A further 20 more minutes of setback. Instead of being annoyed and stressing, I thought about the fact that I would soon be on my way and the speedometer would be working. I rode back to my apartment building. Because I had the dog with me, I couldn’t just leave the bike and run upstairs, I had to put it away in the bike room, then take the dog on the service elevator up to my apartment. I go inside, get the money and head out. I return, pay my bill and I am finally ready to ride my bike. I feel grateful that I have managed to get through all the obstacles and I am RIDING! 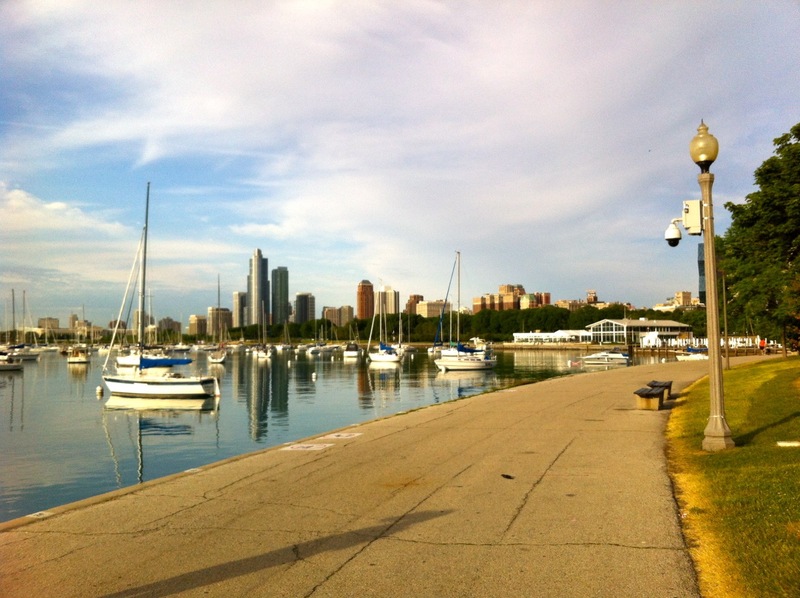 Life is good as I pedal off to the lakefront. I survived four frustrations, lost about a half hour, but am now on my way. I did not stress out at any point in the foregoing ordeal. It was all behind me. The bike ride is about seven miles in and I am looking for a place to take a break. I decide I will head south and relax at one of the tables by the Field Museum. They are in the shade and always a pleasant stop. Just as I am getting ready to pedal south, I feel a slight sponginess in the ride. I had new tires put on a week ago. They are a smoother ride than the old tires. The tires I replaced had 85 pounds per square inch PSI of air pressure. The new ones only need 65 PSI, so they feel more comfortable rolling across the pavement. But is the sponginess I am feeling a result of the slightly softer tire, or is it losing air? I ride another hundred yards and realize that if I am losing air, I don’t want to be riding away from my apartment and the bike shop. I stop, dismount and squeeze the rear tire. Sure enough it feels soft. The tire is leaking air. Stressor number five – a flat tire. Take a deep breath; let it out slow. Again. I turn around and head back to the bike shop. There is no point in getting a flat tire several miles farther away and needing to walk back for repairs. Again, instead of stressing about this I am grateful that I caught it when I did and am possibly going to be able to ride to the bike shop as opposed to walking the bike back with the dog in the basket in 85F weather. I arrive at the bike shop and the mechanic says he can have the bike ready in about an hour. Okay, it is after 11:00 AM and it will be time to walk poochie soon, so I agree and walk home with the dog. When I get home, I am hot from the riding and walking back in the sun. The good news is that I have a huge cantaloupe in the fridge and I can eat half of that for a rehydrating pick-me-up. Since it is just about lunch time and I find myself hungry, I also make up a bowl of my low fiber parfait and down that too. By the time I return to the bike shop it is 12:30 PM. My tire has been repaired. There was a tiny piece of metal stuck in the tire that tore the tube. I was lucky to have sensed it when I did. I pay for the repairs, tip the mechanic and am on my way. I left the dentist over three hours ago and have achieved a total of just over seven miles instead of the usual 25 to 30 in that amount of time. The temperature is pushing mid 80’s. The best news is that I have weathered the storm of stressors and feel fine. I have eaten and am not hungry as I take off on the bike again. I finished the day with a fine 25 mile ride. It ended later than I had expected and the temperature was hotter, but I managed to get my ride in and felt great at the end. Looking back at the seeming symphony of stressors, I am able to laugh about it. Talk about a perfect storm! I couldn’t dream that series of events up, if I were trying. I felt good remembering some of the lessons I had learned about dealing with stress. First, stress is not caused by events alone. What we say to ourselves – our thoughts – plays a big part in the stress experience. Check. Instead of dwelling on the delays I was experiencing I moved my attention to more positive ideas and dodged the bullet of stress completely. I hope these examples have been useful to you. They also shows that even retired guys can encounter stress in their daily lives. Hi Tony, nice to see you back after some days. Atleast after stress readers are fortunate enough to read you again. Hope all is well. Needless to say , your blogs are superb as usual, simple language but crafted in deep meaning. Excellent. Thanks for your kind words. Stay positive! Thank you for sharing this, Tony. I am very prone to stress, and like you said it’s usually like a snow ball effect: feeling worse because you keep putting negative thoughts into your head. I have a new theory, that there’s always something to enjoy and we must try to find it, even in times of stress. Be grateful you get another day on the planet, that it’s not raining, that you’re healthy, that things could have been ten times worse than they are now. Hope you encounter less trouble with your next ride!